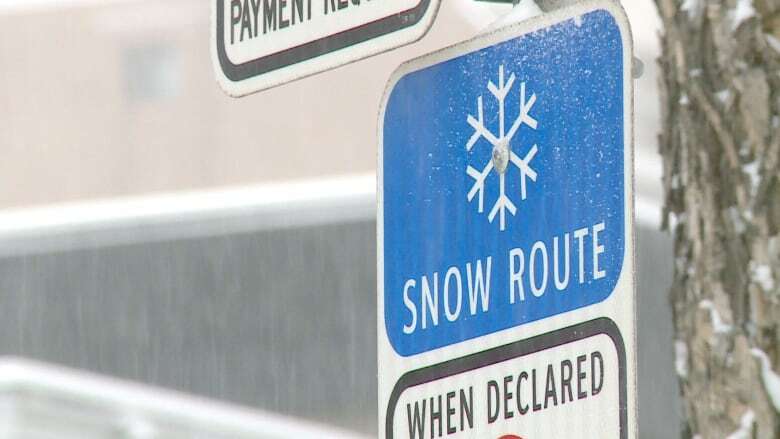 Steady snowfall through the recent cold snap means Calgary's snow route parking ban will come into effect on noon Monday. The city-wide ban means parking will be restricted on designated routes for up to 72 hours, or until the city declares the ban is lifted. Vehicles left on routes with a blue sign and white snowflake can be ticketed for up to $75, or towed. About five centimetres of snow fell on Friday, and the snow is expected to continue on and off until Sunday. Another two to four centimetres is predicted for Saturday. The city brought in extra equipment in anticipation of the snow, Calgary Roads spokesperson Chris McGeachy said on Friday. "Crews have been working around the clock since before the snow started falling on Friday," McGeachy said in an emailed release Saturday. "We've seen numerous snow events in the past few weeks, coupled with frigid temperatures that continue challenging our snow clearing efforts. The parking ban will help us make good progress on our bus routes and connector roads." During snow route parking bans, Calgary Parking Authority offers free parking from 9 p.m. to 6 a.m., and accessible parking zones are exempt from bans. Downtown and business improvement areas only ban parking overnight — parking is allowed on those routes between 6 a.m. and 9 p.m.
More info on the ban and what addresses are affected is available on the city's website.